The Nintendo DS has been home to many direct and enhanced ports of Super NES titles over the years, with games like Final Fantasy IV, Chrono Trigger and Kirby: Super Star Ultra standing out as some of the more notable examples. 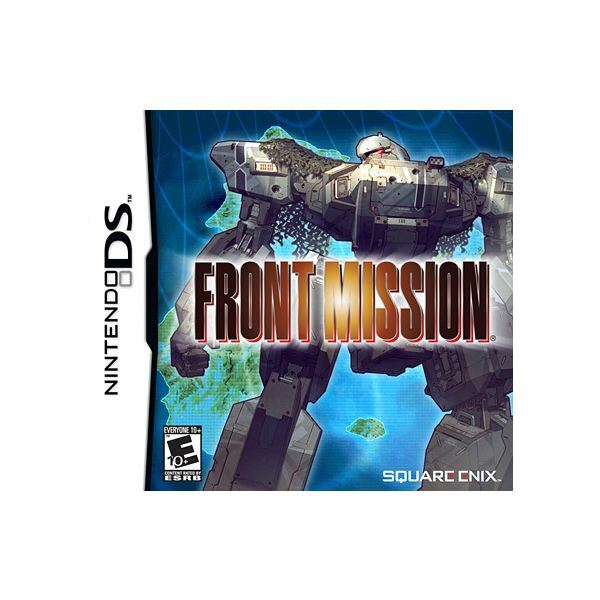 Flying somewhat under the radar, however, is Front Mission, a 2007 DS re-release of a 1995 Square (now Square Enix) strategy RPG that had previously only been available in Japan. Like other Front Mission games which had been previously brought over to North America, the game features a group of pilots fighting battles using giant robotic mechs against a backdrop similar to modern-day world conditions. It took more than a decade for this game to receive an official English-language release. Was it worth the wait? There are two different plot lines featured in this game. The first, which was the story featured in the original Super NES version of Front Mission, stars the unfortunately named Royd Clive, who starts the game as a solider of the Oceana Community Union. When Royd and his unit are ambushed, his fiancée Karen is seemingly killed and he and his soldiers are blamed for the bombing of a United States of the New Continent (USN) facility located on Huffman Island. The incident results in war between the OCU and the USN, as well as Royd’s dismissal from the service. He eventually is hired on to work for a mercenary brigade and learns that Karen may well be alive. What follows is a well written tale that includes a heart wrenching plot twist. It kept me hooked throughout. The second scenario, which was not included in the Super Famicom (the Japanese name for the SNES) original, stars an USN soldier named Kevin Greenfield. Kevin’s story contains many characters from and ties to Front Mission 4 for the PS2, as well as to Front Mission 5: Scars of the War, which unfortunately was never made available in the States. While the Royd scenario is definitely the better of the two, it is nice to have two separate story lines to play through. It adds tremendous depth and replay value to the game, and it almost makes this feel like two tactical role playing games in one package. This is one strategy RPG that’s definitely heavy on the strategy and light on the RPG. There are several different mission-based battles that take place during the course of Front Mission, and prior to each you will be exposed to some plot development and be allowed to upgrade your mechs, known as "Wanzers" in the game’s terminology, with better parts and weapons. Once you get out on the battlefield, you will take your troops and pit them against a group of opposing soldiers in turn-based combat. Attacks can do damage to four different areas on most Wanzers — the left arm, the right arm, the legs and the torso. Destroying arms limits the weapons that a mech can use, while taking out the legs immobilizes the Wanzer. Players can use mêlée weapons, rifles, machine guns, rocket launchers, and take advantage of a number of different close-combat, medium-range and long-distance attacks. All of this can cost a pretty penny, and since there are no random battles, the only way to earn some extra cash is by fighting in Arena battles during intermissions. On the whole, Front Mission features fairly standard tactical RPG action, but considering that this is a direct port of a 12 year old game, it does lack some of the bells and whistles of more recent games in the genre. It’s a perfectly serviceable strategy game, but it does feel a little dated compared to the likes of Luminous Arc or Final Fantasy Tactics A2. On the plus side, when you complete the game as either character, you can not only play through the game with the other protagonist, but you can also replay through the same storyline on an easier or harder difficulty, which unlock once the end credits roll. So what it lacks in modern conveniences and depth it makes up for with re-playability. Of course, while the gameplay feels slightly dated, the presentation is absolutely archaic. In terms of graphics, music, sound quality, etc., this is a 16-bit game from top to bottom, and a rather unattractive one at that. Unlike other remakes from the Super NES era, there have been no upgrades to the visuals. There’s no added voice acting or anything like that. Worse, the font can be somewhat difficult to read on occasion. The character portrait artwork isn’t particularly noteworthy, but on the bright side, the Wanzer models are quite attractive. I enjoyed playing through Front Mission, but I can recognize that it will appeal to a very limited number of people. It was great experiencing this seemingly forgotten piece of Square’s heritage, but seeing as how it didn’t receive the same kind of TLC as the company’s other DS remakes, it just looks and feels incredibly old. If you’re a rather dedicated strategy game enthusiast, you own one of Nintendo’s dual-screen handhelds, you’ve already spent countless hours on FFTA2, the Luminous Arc games and possibly even Hoshigami Remix, and you’re looking for something else to test your tactical genius, then this is a game you should definitely check out — assuming you haven’t already, but if you’ve played Hoshigami Remix, you probably have. Everyone else interested in a good strategy RPG should check out one of the titles mentioned above, or possibly a strategy game designed specifically with the DS in mind, say Sid Meier’s Civilization Revolution or Age of Empires DS, instead.